Please make sure that you have a Teacher(Editor) role or above on the other course(s) you want to link recordings from. N.B. If you are using Internet Explorer as your browser, please make sure that it is Version 11 or above. Steps 1-7 are the same as of setting up a link to recordings from the same course. 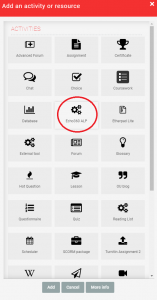 Log in to Moodle with your LSE Network Username and password. Navigate to your course, and click Turn editing on. Scroll to the section in which you want the link to your recordings to appear. 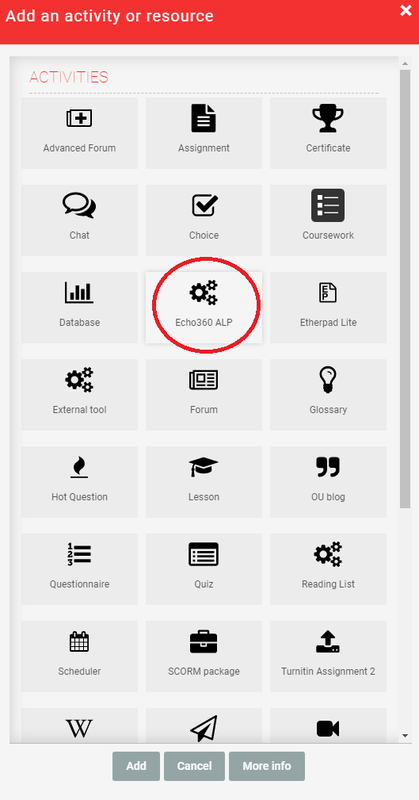 In the “Activity chooser”, select Echo360 Lecture Recordings and Add. Type a name for the activity, e.g. “Lecture recordings”. Click on Link a different section. You will see three drop-down menus. 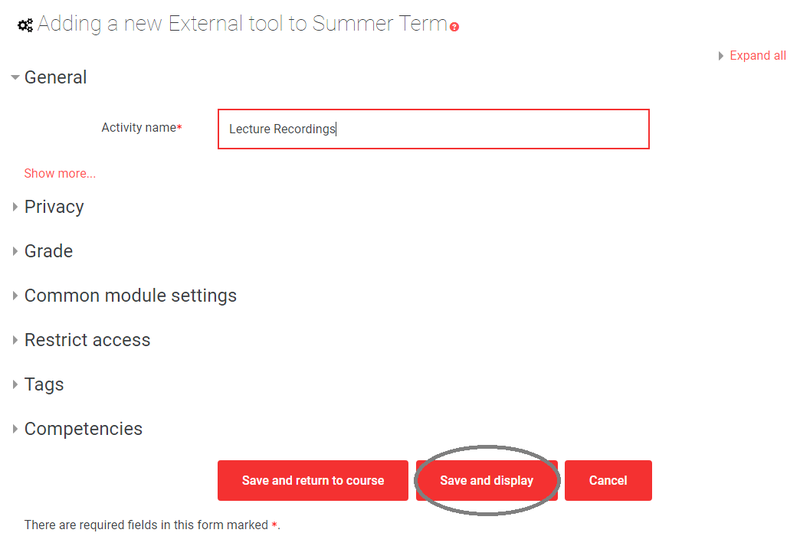 First select the Course (please note that you need to be an editor on the other Moodle course you wish to link recordings from) by starting to type the course code, then the Term and finally the Section. If you want to have one link in your course to a page listing all your recordings, select Link to the Section Home and click LINK CONTENT. If you want to link to an individual recording, select Link to a classroom, choose the appropriate recording and click LINK CONTENT. Your are finished. You can now navigate back to the main course page. Repeat steps 1-11 on this page for each course that you wish to link recordings from. Please note that your students must use the link in your Moodle course to access the recordings. You will not be able to distribute these links to your students by email, or on a web page outside of Moodle. Using the method above ensures that your students are correctly enrolled in your Echo360 sections. To read about the pedagogical rationale behind recording lectures, Copyright and Intellectual Property Rights, and to get further information, please go to Tools@LSE. To see how students can watch recorded lectures, please see the Moodle FAQ for Students.